This article is about the Duel result. For the action, see draw a card. A Duel results in a DRAW (Japanese: 引（ひ）き分（わ）け Hikiwake) when both players satisfy a victory condition at the same time. Both players' Life Points become 0 by a single card effect at the same time, such as that of "Self-Destruct Button", "Tremendous Fire", or "Destruction Ring". A single card effect causes both players to draw cards when neither player has enough cards left in their Deck, such as that of "Card Destruction" or "Morphing Jar". A single card effect causes both players to add all 5 pieces of "Exodia" to their hand, such as "Emissary of the Afterlife" or the above "Card Destruction" or "Morphing Jar". This can also happen during the initial draw of the game, which is the only way to DRAW before either player starts their turn. Both players activate "Final Countdown" on adjacent turns, and then the later player uses "Pyro Clock of Destiny" to advance their "Final Countdown" by one turn, causing both to win simultaneously 19 turns later. At the end of a turn when "Last Turn" was activated, both players' monsters remained on the field or both left the field. This is the only card whose text specifically mentions a DRAW. It is also possible for two different types of victory conditions to be fulfilled by one effect, such as completing "Exodia" by returning a piece from the field to the hand that was Summoned by "Relay Soul". Unlike a Duel, a Match can never end in a DRAW in official tournaments. If a Match would end in a DRAW, extra Duels are played until the Match is decided (even if the Match time limit runs out, in which case the Duels transition to sudden death). Outside of a tournament, a match can end in a DRAW if both players have one victory and one DRAW or if all three duels end in a draw. In card texts, the term DRAW is always written with all capital letters to distinguish it from the common term of "to draw a card". 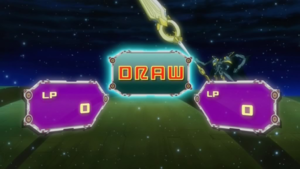 In the anime, a Duel that is interrupted prior to its conclusion is sometimes considered a DRAW. However, this largely depends on the context of the story, since interrupted Duels have also been treated as forfeit or no result. In the anime, a DRAW has occurred in the following occasions. The following cards were placed on the Forbidden/Limited List either in part or entirely due to their ability to end a Duel in a DRAW. Note that some of them might have also be restricted for additional reasons that are not related to this (and as such, not listed here). Morphing Jar Forbidden Both players have to discard their entire hands and draw 5 cards simultaneously. Card Destruction Forbidden Both player have to discard their entire hands and draw the same amount of cards simultaneously. Last Turn Forbidden This card directly determines the outcome of the Duel by having two monsters battle each other and declaring the victory of the player whose monster survives. If neither monster is destroyed, or if both are destroyed, the Duel ends in a DRAW. It is especially easy to pull off by using a monster that cannot be destroyed by battle, or that takes down the battling monster with itself. Self-Destruct Button Forbidden Its effect specifically sets to 0 both player's LP, making it an instant DRAW upon resolution in all cases. One of the main reasons was players purposefully using it to escape from Duels they were about to lose, disrupting tournament result-keeping and time limits. Ring of Destruction Limited This card was once Forbidden as its original effect destroyed a monster on the field and inflicted damage equal to its ATK to both players simultaneously, so it could end the Duel in a DRAW by destroying one whose ATK was higher than each player's LP. This is no longer possible, due the card being issued an erratum that forces it to destroy an opponent's monster whose ATK does not exceed their LP, as well inflict the damage to you first and then to the opponent, and has been kept to Limited ever since. Prior to this change, this card used to be the most consistent way to end a Duel in a DRAW. ↑ Yu-Gi-Oh! (Toei) episode 3: "Clash! The Strongest Monster"
↑ Yu-Gi-Oh! episode 78: "Friends 'Til the End, Part 4"
↑ Yu-Gi-Oh! episode 150: "Deja Duel! - Part 2"
↑ Yu-Gi-Oh! GX episode 52: "The Graduation Match, Part 2"
↑ Yu-Gi-Oh! GX episode 130: "Unleashing the Dragon, Part 2"
↑ Yu-Gi-Oh! GX episode 143: "What Lies Beneath, Part 3"
↑ Yu-Gi-Oh! GX episode 152: "The Power Within, Part 2"
↑ Yu-Gi-Oh! 5D's episode 19: "Return to the Spirit World, Part 2"
↑ Yu-Gi-Oh! 5D's episode 127: "Tricking The Trickster"
↑ Yu-Gi-Oh! ZEXAL episode 24: "Hunting Down the Hunter, Part 2"
↑ Yu-Gi-Oh! ZEXAL episode 102: "The Dark Mist Rises: Part 2"
↑ Yu-Gi-Oh! ARC-V episode 11: "Going, Going, Gong"
↑ Yu-Gi-Oh! ARC-V episode 104: "Fighting Between The Rubble"
↑ Yu-Gi-Oh! VRAINS episode 42: "Storm Access"
↑ Yu-Gi-Oh! VRAINS episode 73: "Light Blade that Slices Despair"
This page was last edited on 18 October 2018, at 04:10.